Where have all the badger gone? What is the status of the American badger in Oregon? No one really knows - and I doubt if many Oregonians care. From my experience roaming through the countryside east of the Cascades, I can accurately state that badgers are targets for shooters and for the most part hated by a great many horse people; as badgers dig in pursuit of food and shelter, they create holes in which horses break legs. "The ears are rounded and densely covered with fur, but seem large in comparison with those of many digging mammals. The tail is short and brushlike. Dorsally (meaning its back) the long, shaggy pelage is mottled grayish blending on the venter to light tannish or whitish. A white stripe extends from the nose pad to the shoulder, and may extend to the rump. The face is black with white splotches surrounding a black "badge" on either cheek. 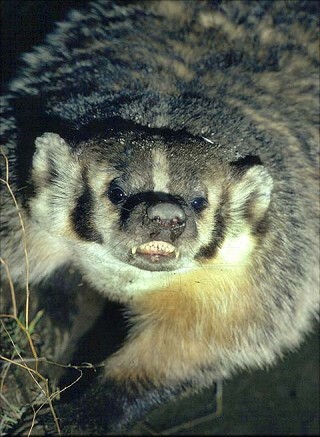 Badgers molt annually. "In Oregon, American badgers occur throughout the region east of the Cascade Range and in eastern Jackson County wherever prey is abundant. They are largely nocturnal but occasionally may be seen abroad during daylight hours." There is no mention that in California the American badger is a "species of concern," and in Canada, two subspecies, Taxidea taxus jacksoni and the T. t. jeffersonii are now listed as "Endangered." Burrowing owls - another Oregon native wildlife species under the jurisdiction and protection of ODFW - have a hard time surviving without badgers; the holes they dig are the best home a burrowing owl can find, and they have a tough time holding their life together without them. My good friend and Eagle Scout Spencer Smith and his step-dad, Steve, manufactured and installed three artificial burrowing owl nest boxes in the Fort Rock Valley to help replace what badgers once were supplying. The American badger first shows up on the fossil record in late Miocene Epoch, around 22 million years ago, about the same time a new great ape fossil was discovered in Ethiopia. The first (and only) badger fossil in the US of A was found in New Mexico in 1935, and named Chamitataxus for the rock formation in the quarry where only the skull was discovered. Right alongside the skull were fossils of our present day pronghorn, then known as Osbornoceros.  A very good sense of smell.  A firm grip like its modern equivalent and this enabled it to kill burrowing animals with a bite to the neck.  Excellent hearing of low-frequency noises, which it could sense at a long distances.  Was an expert hunter.  Was able to prey on many different types of land-dwelling creatures during the Miocene. Throughout the last eight years, my wife, Sue, and I have traveled thousands of miles of the high desert countryside in our 4Runner, surveying golden eagle nests for reproduction. For the first three years we did not see one live badger - and we were looking for them - but did see and count several badger diggings, most with spider webs in the openings. Last year we came upon our first live badger near Glass Buttes, and found a road-killed female on the Bend/Burns highway in about the same vicinity. It would be very helpful for gathering additional data on the status of the badger in Central Oregon if you, in your travels, would take a moment and report any badger sightings to ODFW, or send them to me: jimnaturalist@gmail.com.. I noticed in last week's Nugget, Senators Michael Denbrow and Jeff Golden have sponsored Senate Bill 723 which will put an end to organized contests killing of coyotes and other wildlife. This is one of the best things that's happened since the federal action to protect eagles. Now, if the ODFW head honchos could just take the hint and give the badger and his kin a break. According to ODFW's website, anyone can shoot a badger, all they need is a valid Oregon hunting license and permission to be on the same land as the badger he/she is about to shoot. ODFW places our badger with non-protected species such as coyotes, nutria, opossum, porcupine, spotted skunk, striped skunk, weasel and a whole bunch of other mammals - all of which can be killed anytime, no closed season - and anyone 12 years or younger doesn't need a license to do so.